If there’s been one spectrum analyzer that’s created buzz lately, it’s the Rigol DSA815 budget ($1,295) spectrum analyzer, which tunes from 9 kHz to 1.5 GHz. A tracking generator option will run an extra $200 and the EMI option, which provides quasi-peak detection and the three EMI bandwidths (and especially excites us EMC engineers), is an extra $600. There are a number of other options available. I was able to get my hands on a review unit and am putting it through it’s paces in the next couple weeks. However, with all the discussion of this product lately, I thought I’d give a few first impressions. The first thing that struck me was the compact size. It’s no larger than some of the smaller-size budget oscilloscopes with dimensions of 14″ wide by 7″ tall by just 5″ deep. The second thing that hit me was the weight of the unit for it’s size at 9.4 pounds. Obviously, there’s some shielding inside. The user guide is supplied on CD or available as a download from their web site. I added the guide to my iPad for easy reference. I loved the large color screen (800×480 WVGA). The controls are arranged in logical groupings, duplicating to a large degree that found on Agilent spectrum analyzers. Besides the usual Frequency, Span and Amplitude buttons, major groupings include Control, Marker, Measure, Utility and Edit (numeric and text input). A vertical column of soft keys on the right side select secondary functions. Down along the left side you’ll find a column of analyzer status icons. There’s also a “Help” key that will describe each control for you. After getting some hands-on time in a local EMC test house where we performed some real conducted and radiated emissions measurements, I published a more detailed “first look” in Test & Measurement World’s EMC Blog. A full review will be upcoming on their web site soon. All in all, this appears to be very useful for EMC troubleshooting and pre-compliance testing – and at an affordable price, to boot! Just wanted to say very nice write-up on the Rigol DAS815TG Spec-AN… I have had mine for about 4 months and it has paid for itself twice over!!! We no longer go to the chamber blind. I think you will be happy with the EMI option. The QP detector function works really well for the price. I look forward to more of your reviews, and methods for using this to pre-scan for problems. I am thinking about to get a Rigol DAS815 Spectram Analyzer for EMI near field measurement. Do I need to get a tracking generator and QP detector? May I please have your friendly suggestion as well? Hi James, good questions. 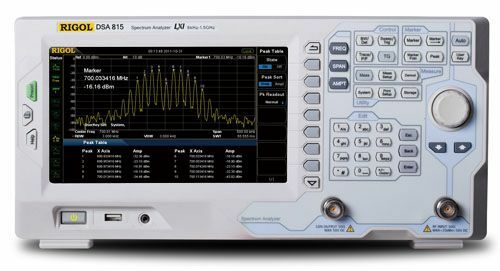 I recently published a full review of this analyzer on the Test & Measurement World web site: http://www.tmworld.com/electronics-products/electronic-product-reviews/other/4398946/Product-review–Rigol-DSA815TG-spectrum-analyzer, that included some comments on the available options. For basic near-field measurements, you could just stick with the basic analyzer. However, the tracking generator for an additional $200 is quite a valuable addition and you’ll find it useful for many types of swept measurements. It must be ordered at the same time as the analyzer, as it’s not retrofittable. The other options are actually built-in to the analyzer and may be purchased and activated by simply entering in a license key. So, these other options may be added later, as you need or have the funds for. Hi Kenneth, thank you for feedback. And one more question. What about the E field or H field probes? Any suggestions? Hi James, there a number of manufacturers making these near field probes. I use the set from http://www.Beehive-Electonics.com. I’m also reviewing a nice set of four probes from http://www.Com-Power.com. Of course, you can make your own quite easily. Just refer to my many articles on the subject. I don’t know of anyone offhand. I have a copy, but have not had a chance to load it in yet. It does seem a useful tool, however.